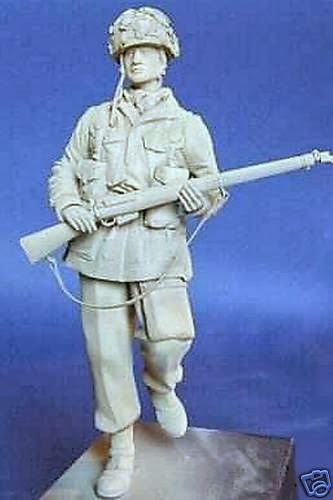 This figure started life as a non-de script British WWII soldier depicted running. I think that it is an early Maurice Correy figure but cannot be sure. It was beautifully sculpted, well executed but somehow didn't do it for me in inspiring to paint it. 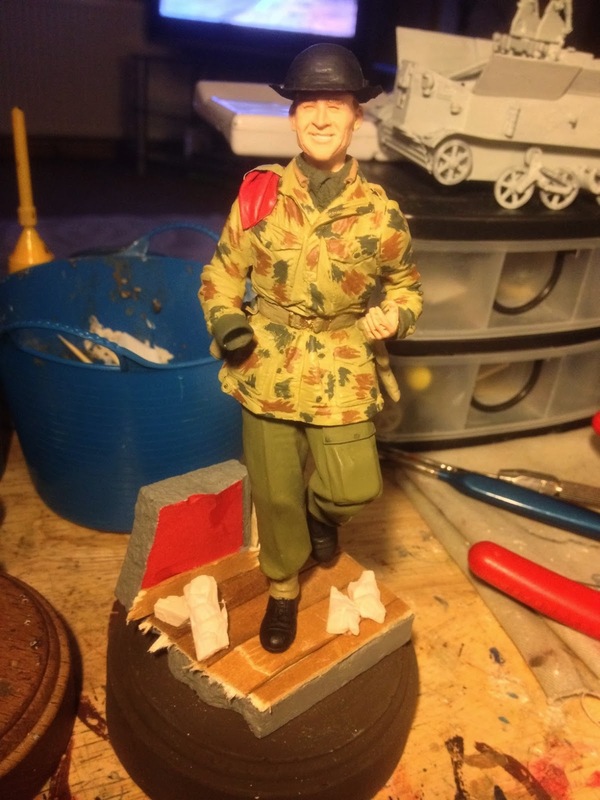 As a result it sat in storage for a few months without my touching it until I saw a 1/6 bust depicting Major Alan Digby Tatham-Warter in the Battle for Arnhem. If you are unfamiliar with the man, he became famous among the Parachute regiment for wearing a bowler hat and using an umbrella to direct his men during the battle. In my opinion he epitomizes everything that an eccentric Brit should be. It was shortly after I had a flash of inspiration and decided that the uninspiring figure in storage could possibly be converted to give a good representation of Tatham-Warter. Unfortunately I don't have any images of the initial part of the figure conversion as I began this before I had even considered a web site or started using twitter. I will however attempt to describe what I did to the figure up to this point. The figure conversion was kept as minimalistic as possible. The first and most obvious thing was to remove the helmet and replace it with a bowler hat. This was made from Miliput and Lead foil for the rim of the hat. The umbrella was made from copper wire, milliput and lead foil. I also made a red beret folded under the epaulet from lead foil. The figure was painted and at that stage I hit a bit of a brick wall. I had not considered the position of of the arms for the figure. It had originally been depicted holding a Lee En-field rifle, and wanted to have the figure holding an umbrella. This left the other arm and hand in quite an unnatural pose and would mean dis-assembling portions of the figure and re-working the pose. At this point I lost enthusiasm, placed the figure back into storage and forgot about it until now. 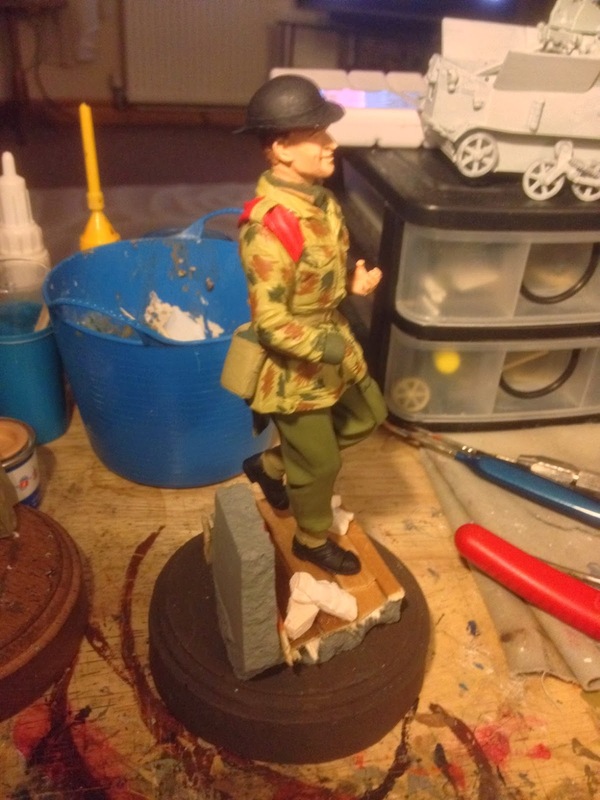 While the uniform does not require much work, the bowler needs additional work, the face needs to be re-painted and something has to be done about the pose of the left hand. 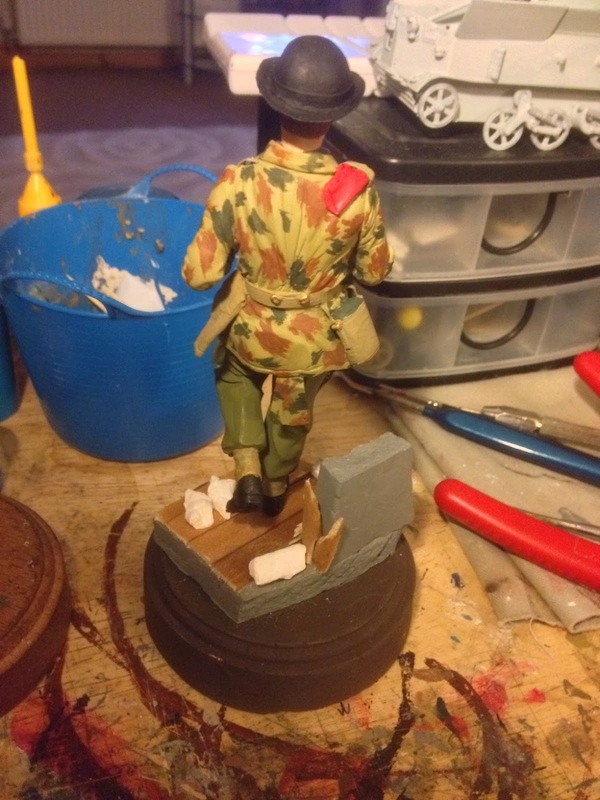 I had considered removing the arm and re-posing but after a little "research" (watching the film a bridge too far) I noticed that a number of the Paras were running around with their webbing and packs removed and being held in their hands. The original figure had the front webbing ammo pouches supplied but not the back pack. So the plan at this stage is to quickly knock up a webbing back pack out of sculpey, and join them all together with some scrap brass fret material and have him holding the umbrella in one hand his webbing packs in the other; running from one building to another with his kit. The figure itself required very little work and as such was finished rather quickly. I have re-painted some parts and touched other parts up. This was then followed by a light shading and highlighting with various oil colours to bring out the details of the figure. A little more work has also been progressed on the base at this stage with colours added, some debris and a little more wood in places. 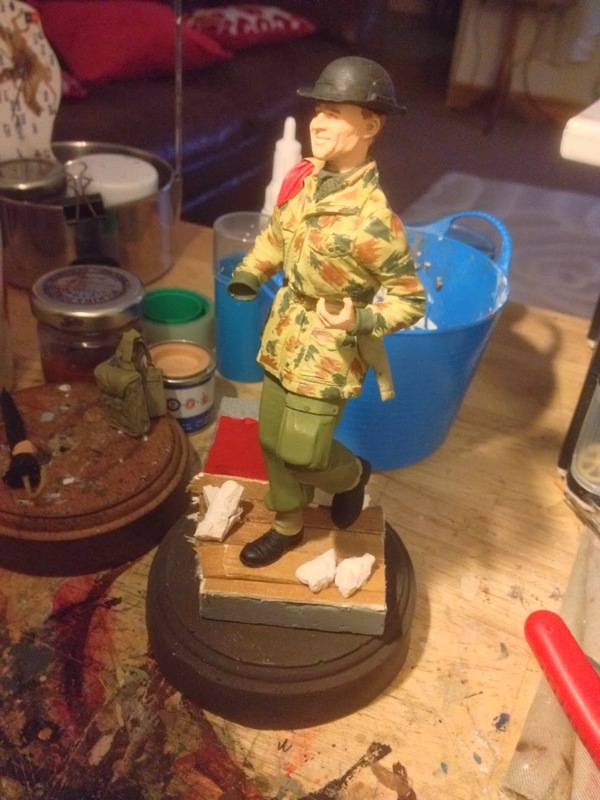 The figure just needs the left hand and umbrella, some more oil work and the straps added for me to declare it complete. I will also add a lot more debris and dust to the base before I am completely happy to display this as finished. I think that I will have to raid the "terrain box" that I have for some interesting bits of additional rubble to add ! Finishing touches for this figure were kept really simplistic. I added some additional rubble to the floor and gave the whole base some oil washes in burnt sienna and then lamp black. The figure itself just needed some assembly and shading/highlighting in oils to finish it off. I'm really happy with the conversion and it was fun to finish off after such a long time. I am however kicking myself as I forgot to take some clean finished shots in my home made booth before taking it work for display. One of these days I will make a point of bringing him home with me to get some better shots. In the mean time these are a few shots of the model almost complete and totally complete on my workbench. I hope you enjoyed reading about my latest project and as always I would love to hear your comments.